Newly developed SS21 silver ink delivers brilliant print results. The metallic colour collection contains 648 colours. SS21 orange ink is suitable for representing the vibrancy of fresh foods as well as corporate colour palettes. SS21 light black ink reproduces highly accurate grayscale printing with no unexpected colour shifts and smooth grayscale gradation without tone-jump. Best-in-class print speed means high productivity rates. 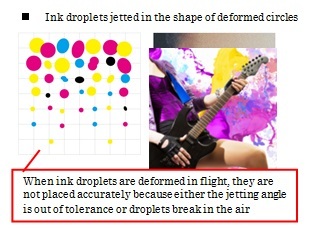 Highly reliable inkjet technology optimizes waveform to achieve the precise placement of the ink droplets onto media. MAPS3 reduces banding and uneven colour printing. The continuous register mark detection function enables the continuous cutting of a whole roll of media while simultaneously taking up unrolled media. The over-cut and corner-cut functions ensure clearly cut edges with no residues. The segment correction function facilitates precision cutting over longer-length prints. 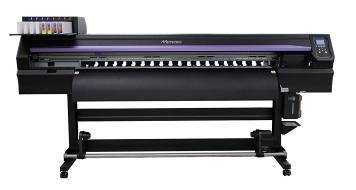 The cut-and-print function averts printing problems by cutting the media prior to printing. SS21 silver ink’s brightness is 1.67 times greater than that of conventional silver inks. *3 Exceptional brightness means high value-added printing and mirror effect results that exceed expectations. 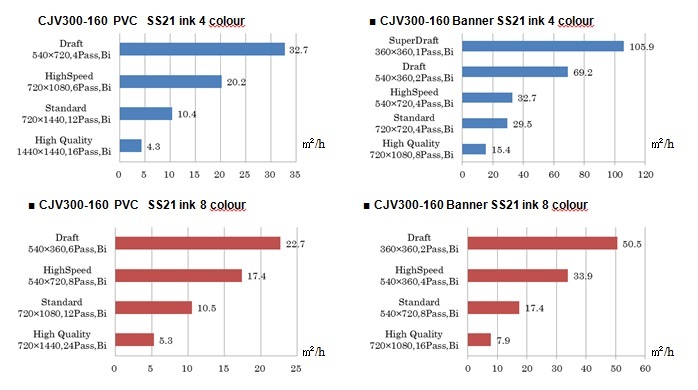 *3: SS21 silver ink comparison with ES3 silver ink measured at Mimaki HQ. SS21’s metallic colour collection contains 648 colours that are easily printed using the RIP software, RasterLink6. From the printed metallic colour collection, an operator may then select a metallic colour from the Illustrator swatches. Through simple operations, impressive and brilliant metallic colour print products are created by SS21 silver ink. By using the SS21 orange ink as a process colour, 94.8% of the PANTONE colour chart is matchable with approximate colours. Thanks to a wider gamut with the orange ink, food freshness can be simulated, and corporate colours can be faithfully represented. Two newly developed staggered printheads deliver a wider print swath. 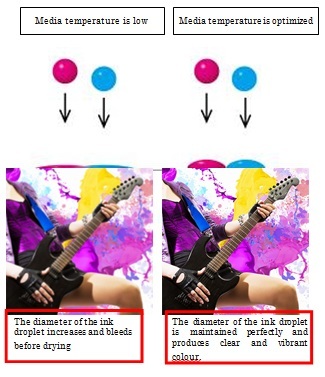 Each ink colour has its own specific gravity and viscosity. 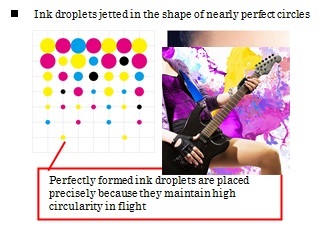 To achieve precise placement of the ink droplets onto the media, Mimaki designed an optimum waveform that allows the printhead to jet each ink colour at the appropriate jetting angle without losing perfect ink droplet circularity. Moreover, various ink droplet sizes are precisely placed from the minimum size 4pl to the maximum size 35pl. 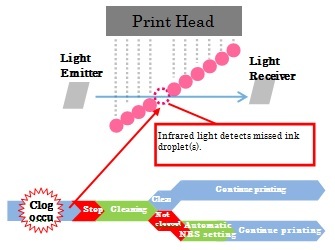 Small droplets create beautiful high-resolution printing, and large droplets are essential for high-speed printing. Thus, the CJV300 satisfies a wide range of needs including beautiful high-quality printing and productive high-speed printing. When the temperature of the media is not optimized, the perfect shape and size of droplets do not appropriately adhere to the media. A patented three-way intelligent heater is built into the CJV300, and each heater maintains the temperature appropriately to obtain high-quality printing. The figures below detail each heater. 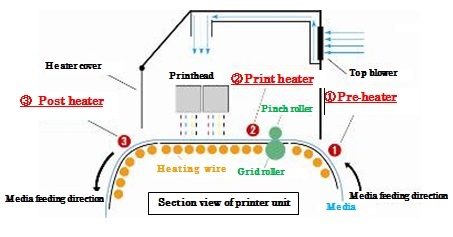 Preheats media to the appropriate temperature before printing. Maintains temperature to produce vibrant colours and improves adhesion of ink droplets to media. Enhances ink dryness, prevents ink bleeding, and secures stable media take-up. Generally, swath boundaries are straight lines. Therefore, a slight misalignment between boundaries causes banding or uneven colour printing. MAPS3 reduces banding and uneven colour printing with blurred boundaries similar to gradation printing. *Optional Mimaki Bulk Ink System 3 (MBIS3) is required for using 2L ink packs.